Following it’s premiere at New York’s DocuWeeks, and it’s nomination for Best Documentary Short in this year’s Academy Awards, the American-Rwandan film Open Heart features in the Official Selection category at this year’s IDFA Festival. A quick glimpse at the documentary subject may run the risk of looking like nothing more than a service-centric piece, exploring the world of poverty through a Western, humanitarian lens. Fortunately, director Kief Davidson (Kassim the Dream, The Devil’s Miner) delivers a forty-minute film that is remarkably multi-faceted and poignant for it’s short running time; taking a small subject and exploring it for all it’s universal resonance. 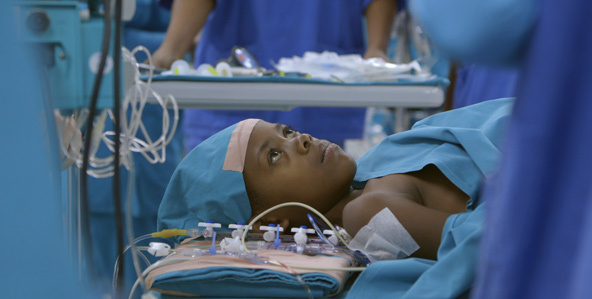 Open Heart tells the story of eight young Rwandan children’s journey to Africa’s only free hospital, The Salam Centre in Sudan, for life-or-death surgery. All suffering from different stages of rheumatic heart disease, some are newly diagnosed, whilst others have been sick for over a decade, with only months to live. Through medical research, Keir comes across some haunting facts – that 13 million people are diagnosed with the condition (many of which die from lack of treatment), whilst it is virtually non-existent in North America and Europe. As the kids travel across the continent from East to North, we hear from the desperate families that the children have had to leave behind, as well as supportive authoritative figures, such as the medical centres founder, Italian war surgeon Dr. Gino Strada and Rwanda’s only public service cardiologist, Dr. Emmanuel Rusingiza. Together with their passionate team of aides and carers, they share their insight on the difficult nature of healthcare in impoverished Africa, plus the desperate need of governmental funding and support so that they can keep this vital care free for dying children. This omnipresent financial factor looms over the documentary and, far from just being a heartrending story; it makes the film a tense and gripping one. Aside from the solemn, potentially fatal surgical operations, it’s a film of great warmth and auspicious integrity. Davidson is not a rhetorical, observational filmmaker. Spending months with his subjects, the crew’s devotion to, and relationship with, these poor children and the hardworking doctors trying to keep them alive is so readily aware in the bones of the film, and the beautiful framing from cinematographer Zak Mulligan. With the uncertain future of The Salam Centre, Open Heart is an important, impassioned documentary, both melancholic and uplifting in equal measure. This review was featured at DocGeeks. Be sure to visit the website for some excellent documentary discussion. This entry was posted in ★★★☆☆ (3) and tagged american documentary, documentary, docuweeks, dutch film festival, idfa, kassim the dream, kief davidson, open heart, open heart documentary, partners in health, rwandan cinema, sudanese documentary, the devil's miner, the salam centre. Bookmark the permalink.